The petition’s executive summary and full text are posted on the Lawyers’ Committee website, as of April 9. 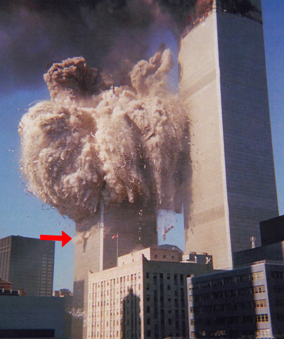 The WTC at the top of this column illustrates “ejections” or “squibs marked by arrows that, according to the petition-filers, provide evidence of explosion. So does molten steel, they say, which most logically could come from thermite or thermate, not from airplane fuel. The photo below shows examples of molten steel. President Trump and Attorney Gen. Jeff Sessions in January named Berman to be the interim U.S. attorney for the Southern District of New York. Berman’s experience includes extensive work as a federal attorney, as well as two years as a law partner of former New York City Mayor Rudolph Giuliani. Giuliani became nationally famous, including selection as Time Magazine’s “Man of the Year,” for his visible role after 9/11. But he is known also for having authorized the removal and disposal of WTC steel debris in heavily guarded shipments to China. Petitioners have scheduled a press conference for 1 p.m. Tuesday on the steps of New York’s City Hall in Manhattan. Those who want to add their names to the petition can sign up online here. New names will be displayed on the next filing, which will supplement the one filed this week. Previous inquiries have generated considerable criticism. Former U.S. Senate Intelligence Committee Chairman Bob Graham (D-FL), for example, has protested that The Senate-House Intelligence Committee Joint 9/11 Inquiry that he had co-chaired had been given an unrealistic deadline in 2002 that prevented completion of its work. Later, a 10-member national commission, known as The 9/11 Commission, issued a report in July 2004 that left many serious researchers and 9/11 victims’ family members complaining about many unanswered questions, especially after significant new evidence arose. Civil litigation by victim’s families and others has been repeatedly stalled or otherwise sidetracked. Hurdles include sovereign immunity claims, lack of subpoena power, and settlements, which can prevent litigants from continuing to seek evidence. That article included links to the major U.S. government reports on the 9/11 attacks, as well as to an article by Europhysics News “15 Years Later: On the physics of high-rise building collapses.” The Europhysics report challenged U.S. government findings that the skyscrapers collapsed because of fire. The four co-authors noted that no other skyscrapers in world history have ever collapsed from fire. More generally, these researchers have summarized studies by technical experts who have argued that the three steel-framed WTC towers could not have fallen in place because of airplane crashes and related fires. Professional critics of the official explanations of the buildings’ collapses include the now nearly three thousand licensed architects and engineers who are members of AE911Truth. Also, Ph.D. graduate students at the University of Alaska at Fairbanks for years have conducted technical studies under the leadership of the chairman of its Department of Engineering and Mines, Dr. J. Leroy Hulsey, PE, SE, who reported on interim findings in a 2016 video. Last month, 9/11 victims’ family members won a key courtroom victory in their civil suit against the Saudi Arabian government. A New York federal judge allowed the families’ suit to move forward despite defendants’ claim of sovereign immunity. That office was led in the late 1980s by Giuliani, who went on to win election as New York’s mayor for two terms, ending at the end of December 2001. Giuliani has kept a high profile opposing terrorists since then, including a 2004 presidential candidacy and strong support for Trump’s 2016 campaign. Since 2016, Giuliani has led the counter-terrorism practice of the law firm Greenberg Traurig. Berman (image on the right), the interim U.S. Attorney who will receive the attorneys’ petition signed by 9/11 family members, was a law partner of Giuliani’s from 2016 until his Trump appointment in January. Berman must win U.S. Senate confirmation to receive the prestigious appointment beyond interim status. Prodded especially by family members of 9/11 victims, Congress has shown strong support in recent years for two major investigative initiatives strongly resisted by powerful forces that prefer to keep the 9/11 probes closed. One such victory was release of the so-called “28-pages” that had been suppressed from the 2002 Joint House-Senate Intelligence Commission Inquiry report. The released material documented suspicious pre-9/11 relationships by Saudi Arabian entities with some of the 19 accused airplane hijackers, 15 of whom were Saudi nationals. The other victory was congressional passage in 2016 of the Justice Against Sponsors of Terrorism Act (JASTA), which narrowed the definition of sovereign immunity for civil court claims resulting from international terrorism. Given the high U.S. political and geopolitical stakes, Tuesday’s petition tees up a remarkable, historic civic dialog on one of the most important events within the lifetime of most Americans. In that spirit, the public as well as the media are invited to the press conference Tuesday on the steps of City Hall in lower Manhattan. Lawyers’ Committee Executive Director Harrison and other attorneys on the Committee’s board are also scheduled for discussion of the petition on several major radio programs, including “The Gary Null Show” at noon Eastern time on April 11 and Richard Hoagland’s “The Other Side of Midnight” at midnight Eastern time on April 14. For anyone who worries that progress seems too slow on such issues as 9/11 accountability, the good news is that compelling 9/11 evidence is now in the right hands — the U.S. attorney’s office and yours, as members of the public. Relevant documents can be easily accessed on the website of the Lawyers’ Committee. Andrew Kreig is an investigative reporter, attorney, author, business strategist, radio host, and longtime non-profit executive based in Washington, DC. His most recent book is “Presidential Puppetry: Obama, Romney and Their Masters,” the first book about the Obama administration’s second term. The book grew out of his work leading the Justice Integrity Project, a non-partisan legal reform group that investigates official misconduct.